The approach that the DBSP takes is definitely not a "come one, come all" approach. We are very selective in who we train and in who we let onto one of our training programs. Please see the diagram below. Since the inception of the DBSP in 1996, we have a strong belief that not every person is an entrepreneur. In fact if one had to take a cross section of any community, one would most probably discover that 60% of the community members are not entrepreneurially inclined at all. They are simply job-seekers and do not have an entrepreneurial "bone in their body", so to speak. About 3% would be termed true entrepreneurs – these are people that have an in-built ability to spot business opportunities and to exploit them to the full, often turning the opportunities into large corporations. To these type of people, business is a calling and they would be miserable if they were not involved in starting up businesses. In most communities in which the DBSP has operated, we find that in the region of 22% of the population have some entrepreneurial attributes, abilities and the type of personality that could start up and run their own businesses. In the diagram below these people are referred to as "Enterprising". Most of these attributes and abilities are latent, however. With training we have been very successful in assisting this group of people to discover their latent entrepreneurial talent and potential they have and have assisted them to spot this, to use it and to get into a business of their own. We have found that the closer a person is to the top 3%, the more readily they will take to the process. These people will say things like " I have always wanted to become an entrepreneur, but never quite knew how". 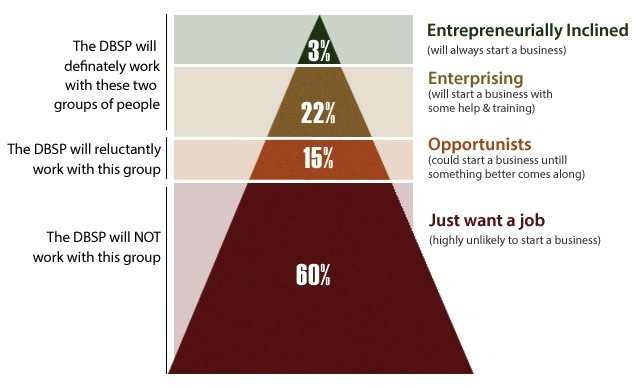 Those in this group that are closer to the bottom of this 22% bracket need a lot more coaching and assistance to discover their entrepreneurial spirit, so they will take a bit longer to be convinced that going into their own business is for them. If one looks at the diagram below, this leaves the 15% group, which are termed "Opportunists". They are the most difficult group to work with, because they are quite fickle. They seem to have an ability to lie and are often very convincing. People who fall into this category are often very persuasive and will often tell you what they think you want to hear. From practical experience we have found that people in this category will convince one that they need to be on the course and will start off well, but if another better opportunity opens up – such as they find employment – then they drop out of the course. We have also found that people in this category, if they do complete the course, most often than not do not have the drive and determination to start up a business, so they end up not doing anything. The DBSP definitely cannot work with the 60% job seeker group and we are constantly refining and improving our selection tools and instruments and honing down our processes so that we can 'weed out' this 15% opportunists. The person must show a measure of enterprising inclination. There are definite qualities a person must possess in order to be said to have entrepreneurial flair, and not all people have these qualities. At the heart of this is a person that must have the propensity to deal with risk and to live with a certain amount of insecurity, as all business ventures have an element of risk attached, some more than others. The other main qualities are self discipline and the ability to make decisions. Self discipline is necessary in terms of the ability to manage one's time and to manage self and the ability to arrange one's life and family life around the demands of the business. Added to this is the ability to say 'no', when certain unreasonable demands are placed on the person, either by friends, family, self gratification and definitely by the business. Also to know when to say 'no' to the business and to judge when it is time to leave the business affairs in favour of family, friends and even self. Many people cannot make an informed decision and stick by that decision, as well as not having the ability to evaluate a decision and to modify and/or change their decision according to what the situation demands. The ability to manage self is also closely linked to what has been said above. Another quality in this category is the ability to work with money in such a way that the person's actions will not jeopardise the business. These are the chief qualities of entrepreneurial inclination. The person must show a willingness and desire to get themselves out of their current set of circumstances - largely to deny being a victim of poverty any longer. The DBSP offers a wonderful opportunity. The person, with a fair share of hard work and stickability, can get themselves out of their poverty trap. A candidate needs to demonstrate this to us. Financial contribution. A successful candidate needs to: 1) Pay their course fees (where applicable) and 2) bring a small amount of money (between R100 and R500 in South Africa, which is the equivalent of between 7 US Dollars and 38 US Dollars) to class in order to do the moneymaking activity with. We see that if a person is truly enterprising, they will find the money and not use the lack of funds as an excuse. Time availability - The successful candidate must be able to attend a course for 4 to 12 weeks in a row (Depending on whether they go through the BBS, the MBS, or the ABS Program), for 8 hours per day during the in-class section of the training, without any conflicting arrangements, especially on the classroom days of the course. * Have a basic education for the BBS program (lower primary school), have an average to good education - high school - for the MBS Program and have a post-school education in order to get onto the ABS Program. In order to get onto one of our training courses, a learner will have to achieve a minimum of 70% in the entrepreneurial assessment. The assessment tests can be administered manually if the situation demands. Under certain circumstances a face-to-face interview can be held to help with the process of learner selection.